Ẹ̀kùàdọ̀r tabi Orile-ede Olominira ile Ekuado tabi Orile-ede agedemejiaye je orile-ede ni Guusu Amerika. ↑ Department of Economic and Social Affairs Population Division (2009) (.PDF). [_text_tables.pdf World Population Prospects, Table A.1]. 2008 revision. United Nations. _text_tables.pdf. Retrieved 2009-03-12. 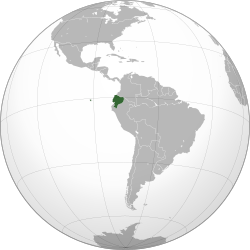 ↑ 3.0 3.1 3.2 3.3 "Ecuador". International Monetary Fund. Retrieved 2009-10-01. ↑ "Human Development Report 2009: Ecuador". The United Nations. Retrieved 2009-10-18. Àtunṣe ojúewé yi gbẹ̀yìn wáyé ni ọjọ́ 8 Oṣù Kẹta 2013, ni ago 15:24.